These last few days of very warm weather have brought the delicious cherries on! Oh my goodness they are yummy! 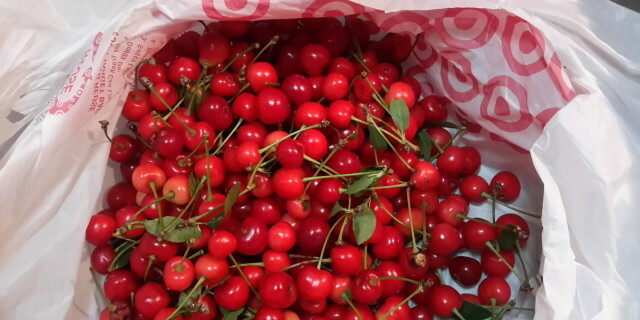 I spent hours yesterday pitting them and tonight, we shall enjoy hot cherry cobbler! Can hardly wait! Equally exciting was having our mail carrier arrive today with 4 big boxes from our friends from Still River Mill. Greg & Deirdre, from Still River, are the folks who help us turn our beautiful wool into luscious yarns. They are also the developers of Greener Shades dyes that produce beautiful colors and are environmentally friendly. I’ll be updating our store with all the new yarns very soon! Also coming from Still River soon, will be lovely finished items like scarves and socks from our wools. It’s very hot here today. Please everyone, be safe wherever you are! Drink lots of water and keep out of this blistering sun as much as possible!